Tester logo for the new pop up restaurant. 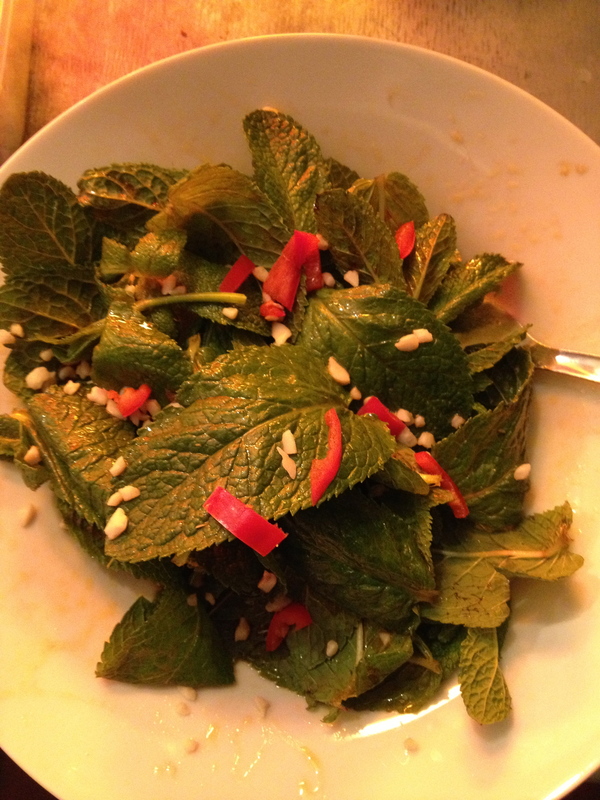 Authentic, regional Chinese cuisine – this is a hard gem to find in London as many will know. In fact, I’m just going to put it out there and say good East Asian food is very hard to find in London, certainly if you’re like me and have a £8 mental (and financial) barrier for how much you can bring yourself to spend on the main course at a restaurant. Home is often still where you’ll find the best tasting East Asian food – learn to cook it yourself or find someone who can and barter with them, especially if you’re a vegetarian. Only last week I went to the new Vietnamese restaurant in Putney, Old Saigon, with high hopes, and I was initially very impressed: the decor was fresh, the shared noodle benches felt modern and convivial. The Banh Xeo was crisper and more textured than I’d ever tasted and a beautiful deep orangey turmeric colour, the lotus stem salad and the green papaya salad both were stunning with strips of fried tofu arranged around the top. Yet they both came only with nuoc mam (fish sauce), not vegetarian at all, and the dressing made the salads taste almost exactly the same. Then came my plate of fried lemongrass tofu, which was initially tasty but after a while all the deep fried tofu started to go down rather heavily, and I even thought I could detect a faint, residual raspy lick of MSG. 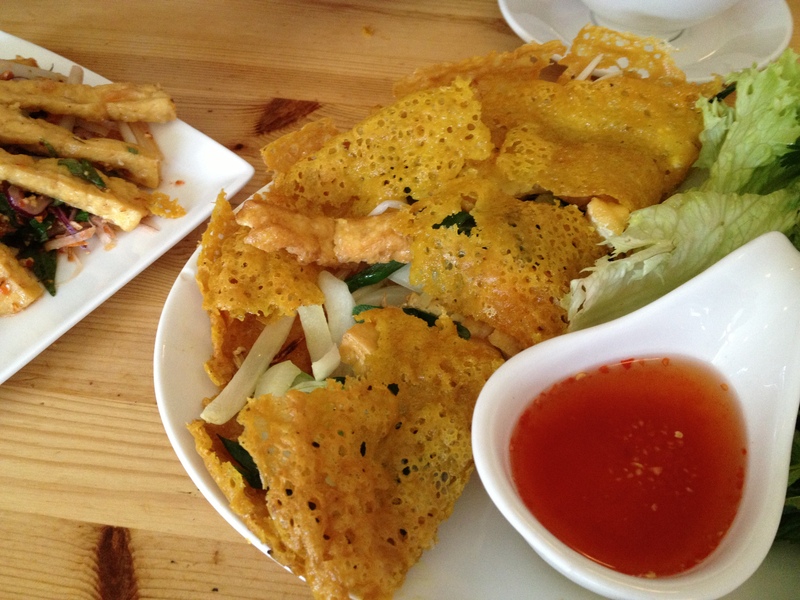 Shards of crispy banh xeo made from mung beans, rice flour and turmeric break off to reveal fried tofu and beansprouts. 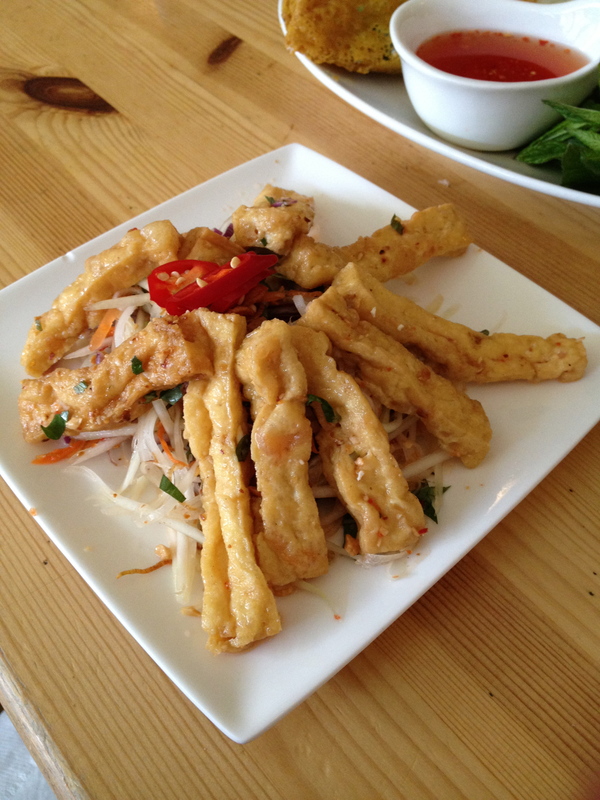 Fried tofu marinated in nuoc cham based dressing line this lotus stem and shredded vegetable salad. 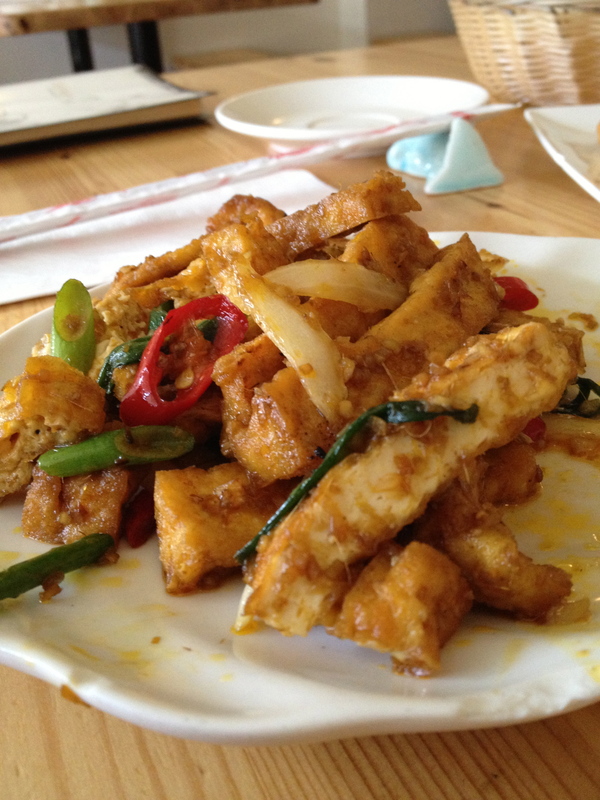 Fried Lemongrass marinated Tofu with fresh chilies and spring onions. I wish you could go to a Vietnamese restaurant and have tofu that wasn’t deep fried to within an inch of its life. 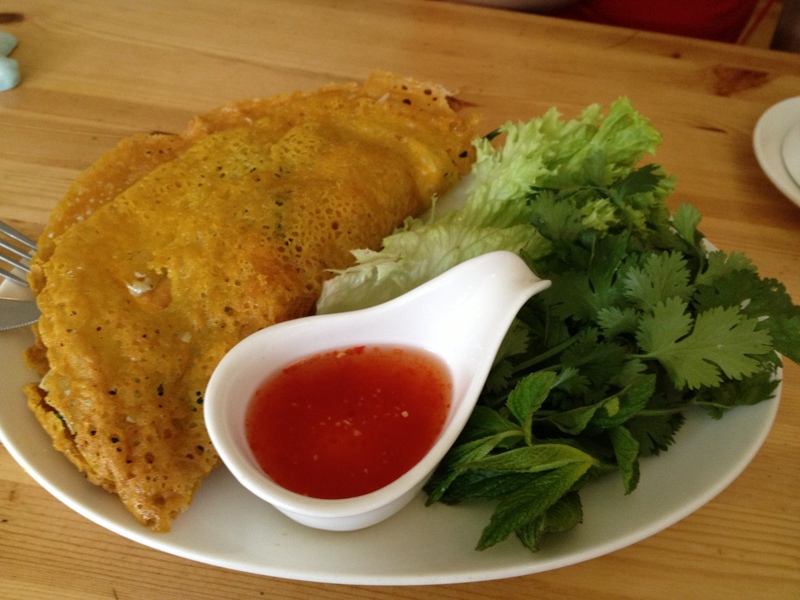 Saigon Saigon in Hammersmith is the only place I’ve been to that serves tofu in more than one way – soft in a claypot with aubergines and mushrooms, or battered in lemograss marinated cornflour to have a thin crust on the outside and a soft interior. And so Old Saigon in Putney gets a 6.5 from me – who knows, if you were eating the meat dishes you might have loved it, but for veggies it was pretty limited – I mean, I would have tried the vegetable curry but I wanted some protein, damnit! I think I even prefer Pho Saigon in Twickenham, another small, West London new Viet place, because even though they also cheekily used fish sauce in otherwise vegetarian dishes, their green papaya salad was a little more fragrant and less flat/swimming in dressing. Pho Saigon is also a little cheaper – our bill at Old Saigon for 4 fairly straightforward dishes, including two light salads, plus rice and a smoothie came to £40, really not that cheap. And so into this Asian restaurant void is where Grub Club strides, taking home cooking to the max, bridging the gap between amateur and professional cooking. Indeed, many people are excellent cooks, but will tell you that the last thing they’d want is to work in a restaurant – the job is tough and intense and not for everyone who loves food. Liv who heads Grub Club has been great in helping me to hook up as a volunteer with some excellent Asian pop ups, and Mama Wangs one one of the most impressive looking based on their website, almost daunting, their food so refined, their marketing so well considered… They’d already done an amazing, well reviewed 9 course banquet at Asia House, and so I went to help out at a one off dinner in Dalston’s Dead Dolls Club. The Dead Dolls Club is a great venue because the kitchen is open plan at the back of the dining area, and so you can really tell how much work is going into the food. Jess and Chris, the head of the team, had prepped dozens and dozens of different components and ingredients for the night: there were boxes of different toppings, freshly chopped herbs, dressings, sauces, stews, syrups, buns, cakes… The detail was so thorough and impressive compared to conventional restaurant fare, with the results meaning that each of the 10+ dishes tasted quite unique. 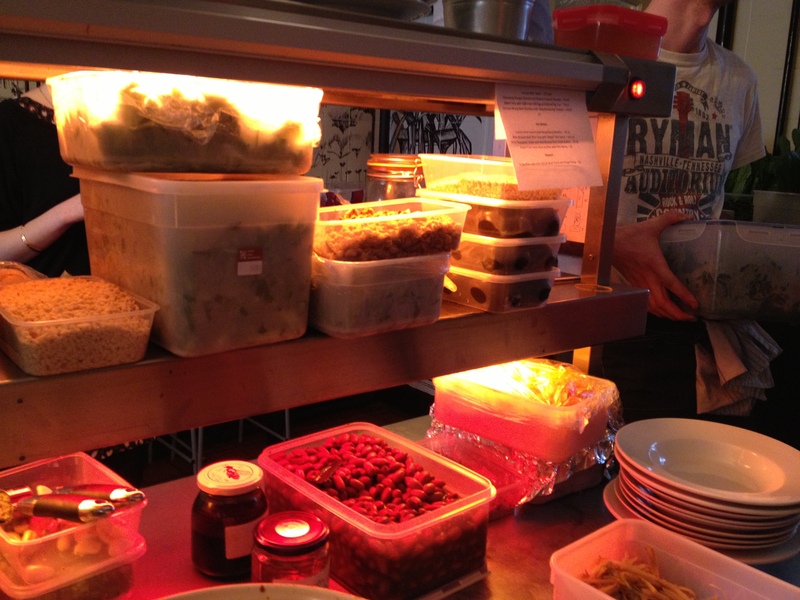 Behind the scenes: Just a small selection of all the prepped ingredients for the 9 course menu at Mama Wang. This entry was posted in Uncategorized and tagged Asia, Asian Food, Biang Biang, China, Chinese, Chinese Food, Grub Club, Noodles, Old Saigon, Pop Up, Supper Club, Vegetarian, Veggie on May 29, 2013 by thejadecave.